Again, a port of an old MsDos intro. 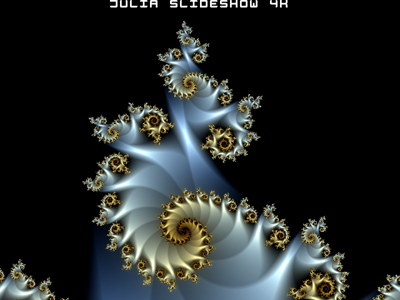 Don't spect too much fun, just a slideshow of some fractals. Hope you enjoy it, anyway. some really good looking fractals in here.. Usually fractals are coloured using the entire spectrum or something. Some taste involved in picking the pretty shapes and nice colours in here.. I think the prettiest images appear in the transitions when the next image is blended about 25% or so with the previous..
Like it a lot !!!! ;) Okis, here goes my thumb down too. It is a pity that I wrote the txt in spanish 3 years ago, cause you would understand that this intro was not supposed to exploit the 4096 bytes. Anyway thanks for appreciating my coder colors. Congratulations to another recipient of the 4K "beautiful-but-slow" award! This was very enjoyable to watch. The colors are absolutely spectacular! A slow/atmospheric music wouldn't hurt here aswell as some more examples and the text shouldn't be embedded inside images (or the viewer should be able to switch it on/off with mouse or something), just my opinion, of course. Nice julias variations anyway. Nice image quality on these fractals. Very nice indeed. page created in 0.014667 seconds with 15 queries.